Amy Gumms has always struggled in life. She lives in a caravan with her mum and falls victim to bullying in school. So when she finds herself swept, literally, away from Kansas and into Oz, she's unsure what it is she's here for or if it's even real. Quickly Amy learns of the fate of the characters from The Wizard of Oz and the untold story after Dorothy leaves. Oz is now overrun by Dorothy, who came back and stole the throne, and it's slowly losing it's magic. Amy becomes embroiled in a plot to rescue Oz, labelled as the hero that has come. Her mission - kill Dorothy. One of my most anticipated novels for 2014, I was super excited to read this having been interested in "fairytale" retellings. 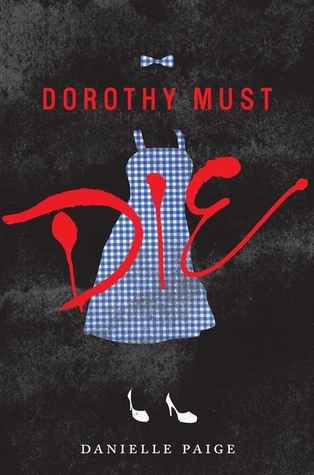 Whilst Dorothy Must Die wasn't exactly what I wanted, it actually didn't disappoint either. Danielle Paige did a great job in mirroring the exact tone that came from the movie The Wizard of Oz. I haven't actually read the novel so I'm not too sure about the tone there, but whilst reading DMD there was that whimsical, dreamlike mood to it but with an unsettling feeling as well. Usually with re-tellings I prefer that whilst the plot is different, the tone is similar enough to recreate the same feelings I had reading the original. It also didn't feel so absurd that Amy had landed herself (literally) in Oz, because gradually the characters begin to pinpoint her reason for arriving. Still, I did feel like she took the whole experience relatively calmly. I would've freaked out! The uneasiness whilst reading was due to Paige's writing and her characters. The plot is suppose to be a lot more darker, but there some points when the violence got really intense and I was left feeling squeamish. Deaths that happened were grotesque and Paige wrote those moments in such a descriptive way I literally thought something was being stabbed in my guts. The characters were also modified so that they lost their original traits and became almost monster-like. It was really creepy, especially the Lion after knowing him as somewhat of a cuddly feline. I'm not sure I love Amy just yet, but she does have great characteristics. She's pretty badass when it comes down to it and I can rely on her to uphold the plot. I prefer characters who have some depth, but aren't exaggerated or overly dramatic. Amy's got scars, but it's something that doesn't overtake the entire story but instead, helps build her character. What I find interesting is the uncertainty of who is "good" and who is "bad". There are definitely two sides painted, and it's been told that Dorothy & co. are "bad", but the people on the "good" side still carry question marks. In fact Amy is constantly reminded to not trust anyone but herself, which keeps the mystery and intensity on edge. There was just one thing I wasn't a fan of, and that was the love line that developed. It was such a typical move done in a cliche way, but because it was a pretty minor part I kind of overlooked it. I do like her male counterpart but maybe if it was done in a more slow and progressive way it wouldn't have been as unbelievable or annoying. Overall though, I really enjoyed this revised version of The Wizard of Oz. There's a lot of potential for it to become even better considering this is the first book of the series and I am so excited to keep reading!